Technically highly developed self-propelled compost turning machine - in use worldwide. Optimum triangular windrow shape and perfect mixing due to spiral-shaped tool layout on the turner-roller. multi-function lever, Informator, standard air-conditioning, dust filter and radio, prepared for protective ventilation. Maneuverable and ground-protecting wide-base tire chassis with two-stage hydro-static wheel drive: up to 1 km/h during shifting, up to 10 km/h for fast maneuvering. Easy off-site use due to compact dimensions when transporting on lift platform (TT3500) or low-loader (TT4000). 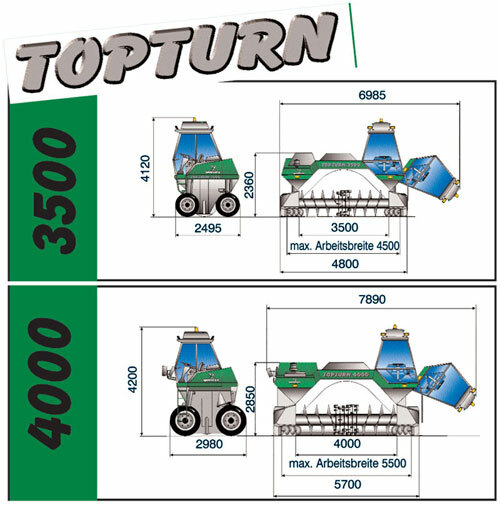 Lateral shifting or combining of windrows due to connectable lateral shifting device saves space and time. depending on inlet pressure, up to 1,000 ltrs/min.